Rumours that Asus is to release a Lamborghini handset are true, it seems, and the phone’s already available for pre-order. Talk of Asus' expanding Lamborghini phone, an extension of the deal it already has with the sportscar maker to produce branded laptops, has been on insiders' lips since 2006. 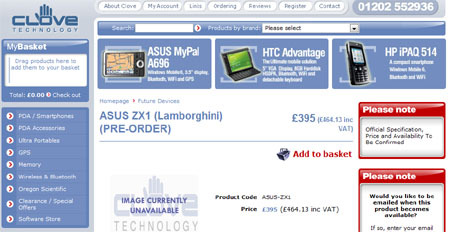 However, online retailer Clove Technology has now created a webpage for the handset, which is called the Asus Lamborghini ZX1. Let's hope the name doesn't confuse Sinclair Research buff. Although Clove hasn’t posted any pictures of the phone, or show of ny specs, it did claim today that its staff have seen the device. Online, the phone is described by Clove as a “Lamborghini-branded mobile communication device for those who want the most stylish mobile device”. Well, duh! A Clove spokesman told Register Hardware that the ZX1 is expected contain a CPU clocked at around 400MHz and sport a touchscreen. Unconfirmed specs have appeared online, and website Mobinaute claims the ZX1 will run on Windows Mobile 6 on a 520MHz processor. In terms of connectivity, users could get 3G, Wi-Fi and Bluetooth, with the added treat of GPS navigation, the site says. However, the Clove spokesman said the addition of a GPS chip was questionable. What we do know is that pre-orders for Asus’ ZX1 Lamborghini can now be placed with Clove Technology, which wants £465 (€600/$920) for the handset.